If CO2 gas really is the existential threat it’s made out to be, then nuclear power is the only solution. That’s if you want to provide reliable and affordable electricity to all comers, rather than destroying businesses and punishing households? In 2018, with debacles like wind ‘powered’ Germany, South Australia and Victoria on show, for all the World to see, anyone still talking about windmills, pumped hydro, mega-batteries and CO2 emissions can’t be taken seriously. And not only their motives, but also their sanity, has to be taken as suspect. Australia is the only G20 Country to a place to ban on the use of uranium as a power source. Notwithstanding that it’s the largest uranium exporter, in the World. Anyone still banging on about CO2 emissions in the electricity generation sector, ought to be banging on about nothing other than nuclear power. Nuclear power is the only, stand-alone generation source that can deliver reliable, affordable power without generating CO2 gas, in the process. For the record, STT isn’t alarmed by tales that man-made carbon dioxide gas (apparently it’s not the naturally occurring stuff?) is about to cause this Orb to incinerate in an eye blink. But that purported prospect is driving energy policy everywhere, wrecking once prosperous, energy-rich countries like Australia. So, while coal-fired power plants will continue to energise the world for generations to come, STT is more than happy to promote nuclear power; not simply because it’s the perfect foil to hyped-up climate alarmists, but principally because it works. The fact that, up to now, politicians in this Country are happy to talk about anything but nuclear power as a solution to Australia’s unfolding energy crisis, speaks volumes. The meme goes that the Chinese character for ‘crisis’ doubles as the character for ‘opportunity’. Well, so it is, with Australia’s self-inflicted renewable energy power pricing and supply calamity. Finally, as the crisis bites hard – crushing households, businesses and whole industries – a few journalists and politicians gifted with common sense, and the temerity to challenge their witless peers, have broken ranks. Here’s a couple from The Australian, detailing a nuclear reaction to Australia’s deepening energy crisis. The standout result from modelling of Australia’s power system carried out by “engineers” is that it is possible to have our cake and eat it too on power prices and emissions — with nuclear. The nuclear option would be slightly more expensive than the existing coal-based system, but less than half the cost of the Australian Energy Market Operator’s existing plan and less than a quarter of the cost of a 100 per cent ­renewables utopia. Going nuclear would also cut power-sector emissions by 93 per cent. The paper, prepared and circulated to MPs as a public service by what is claimed to be “a small group of professional engineers and scientists experienced in various aspects of electricity and distribution”, is an antidote to the drumbeat that wind, solar and ­batteries hold the only answer. The claims and costings no doubt will be challenged, but in it we have a contest of ideas. A key issue is whether higher levels of renewable energy will make electricity cheaper, as its supporters claim. Much will ­depend on whether storage and new grid management technologies can live up to their promise and be delivered at a reasonable cost. The engineers’ opinion is to ­reject enthusiasm and expect more of the same. They say more renewables will continue to result in the speedy destruction of coal generators on which system ­reliability now stands. No one disputes the need to replace Australia’s ageing coal fleet. But for the engineers, the hodgepodge of new technology solutions does not compete with the potential of a proven source of generation that will be there when it’s needed. A striking feature of the engineering group analysis is the amount of extra renewable generation required to achieve a 100 per cent penetration. The complexity of AMEO’s neutral case — where everyone except ­nuclear gets to play — speaks for itself. In purely cost terms, the ­engineers estimate replacing all coal with nuclear would result in a system levelised cost of energy of $90.23 a megawatt hour. They estimated AEMO’s Integrated System Plan would cost $247MWh and a 100 per cent ­renewable mix comprising solar PV, wind and hydro, with support from pumped storage and some battery storage, would cost $415.50. Tempting as the analysis may be, it has some pretty dramatic hurdles to overcome. First is the ban on even considering nuclear energy. Second is that nuclear would face the core problem that currently bedevils coal. Nuclear can be much better than coal at “load-following” intermittent renew­ables to provide power when the wind stops and sun doesn’t shine. But to get maximum efficiency, and least cost, nuclear plants would ideally sell all the power they could generate. The present fascination with a mix of wind, solar, pumped hydro, battery storage, big new grids and complex management systems simply does not fit with a baseload solution. Nuclear may be emissions-free but it still needs strong champions to break into the renewables club. Jessica Lovering is director of energy at US-based research centre The Breakthrough Institute. Here’s an op-ed from Jessica making another case for nuclear: the ability to scale plant down to match the situation. Why the focus on renewables when we are so rich in uranium? While Australia has been a leader in renewable energy technologies, the country is being left behind in the advanced nuclear revolution gathering pace elsewhere. Australia’s prohibitions on nuclear technologies are out of touch with novel nuclear designs such as small modular reactors and microreactors — factory-fabricated, sealed reactors usually under 20 megawatts of power, about 2 per cent the size of a conventional nuclear plant. And it’s not as if the potential for nuclear power in Australia isn’t there. Every year Australia exports more than 400 shipping containers of uranium, enough to generate all of its own electricity with zero emissions. But instead of producing electricity at home, Australian uranium is used to produce vast amounts of clean energy in the US, the EU, South Korea, China and elsewhere. Despite significant investment in renewable energy, Australia still gets 95 per cent of its energy from fossil fuels, with most of its oil imported. While there is plenty of strong rhetoric in Australia on deploying electric vehicles, there have been only 5000 EVs registered to date. Instead of using that imported oil, Australia could be powering a much larger fleet of EVs with domestically fuelled electricity from coal, uranium, and renewables. Small and microreactors also could power regional transportation hubs, providing clean electricity for light rail systems and charging for EV fleets. Surprisingly, microreactors still would fall under federal and state prohibitions on nuclear activities, although they are of similar size to the OPAL reactor operating at Lucas Heights. It seems strange that one nuclear reactor is allowed to produce medical isotopes in the southwestern suburbs of Sydney, but a potentially even smaller reactor is prohibited from generating emissions-free electricity at a remote industrial or mining operation. It’s time for politicians to re-evaluate whether this prohibition properly reflects the risks and benefits of nuclear power. As US senator for Alaska Lisa Murkowski argued recently, microreactors would be a great fit for off-grid communities and industrial applications. This argument is even stronger for a country that has a large mining industries scattered in remote locations. Murkowski outlined a future vision where nuclear microreactors could be shipped by truck or barge to a location, buried in the ground and matched to local power demand. These microreactors require less equipment and maintenance to ensure safety than existing plants, and they can run without refuelling for years or decades at a time. Microreactors could provide reliable electricity that is much cleaner and cheaper than today’s alternative fuels. Britain also recently announced funding for a Canadian microreactor concept that has been designed for remote and off-grid industrial sites. Innovation in nuclear energy is happening rapidly. Yet policy in support of low-carbon energy is biased towards renewables only. In a new report, Clean Energy Standards: How More States Can Become Climate Leaders, my co-authors and I argue that US states could improve their clean energy targets significantly by including nuclear energy in what is known as renewable portfolio standards. Renewable portfolio standards are a mechanism used in the US to subsidise renewable energy. They operate by applying a regulatory mandate to energy suppliers to increase production of energy from renewable sources such as wind, solar, biomass and other alternatives to fossil and nuclear electric generation. Similarly, in Australia the pure focus on renewable energy development only through policies such as the renewable energy target could be broadened to include other potentially viable carbon-reducing initiatives such as new nuclear, as well as waste-to-energy and fossil fuels with technology that captures carbon and returns it underground. By allowing more technologies to be included, emissions can be reduced further, allowing states and utilities to choose the most feasible and best economic option. As hundreds of companies are rapidly innovating across the world’s nuclear industry, Australia is losing its position as an energy leader. And by prohibiting one of the world’s largest sources of carbon-free energy, Australia is making its climate and clean air targets even harder to meet. Moving to a modern, efficient, and reliable energy system means keeping all options on the table, and forging future energy policies that encourage diversity and technology neutrality to make the transition efficient and equitable. As noted above, Australia is one of the world’s largest uranium exporters, and could export a whole lot more were it not for the Labor party’s three mine policy – that limits the number of operating uranium mines in the country. One of those is Olympic Dam, in South Australia’s far north. BHP Billiton extract gold, copper and uranium from a hybrid open cut/underground mine near Roxby Downs. Roxby Downs would be an ideal situation for Australia’s first Small Modular Reactor, capable of satisfying the demand from Olympic Dam, as well as other mining operations in SA’s Far North. Uranium extracted from Olympic Dam is clearly good enough for the French, South Koreans, Americans, Canadians, Japanese and Chinese, being just a few of the 30 countries where you will find nearly 450 nuclear reactors currently operating – their combined output accounts for over 11% of global electricity production – with another 15 countries currently building 60 reactors among them. Despite Australia having the largest uranium reserves in the world, it not only has failed to develop a nuclear power industry, it has legislation which prohibits nuclear power generation in any form. The Environment Protection and Biodiversity Conservation Act and the Australian Radiation Protection and Nuclear Safety Act, specifically prohibit nuclear fuel fabrication, power, enrichment or reprocessing facilities. This post wouldn’t be complete unless STT dealt with the other classic furphy attached nuclear power: namely, the hackneyed claim that nuclear is much more expensive than wind and solar. True it is that wind power is ‘cheap’ – when the wind stops blowing (it can’t be bought at any price); the same can be said of solar power when the sun drops over the horizon, as it tends to do, every single day. So, ‘comparing’ nuclear power with wind and solar doesn’t really involve a ‘comparison’, at all. The USA, the world’s largest nuclear power generator, has 99 nuclear power reactors in 30 states, operated by 30 different power companies, and in 2016 they produced 805 TWh. Since 2001 these plants have achieved an average capacity factor of over 90%, generating up to 807 TWh per year and accounting for about 20% of total electricity generated. Is it any surprise then, that average retail prices across the US are 1/3 of those in wind and sun powered SA? Earlier this year, the State of Pennsylvania sent a delegation to Australia to lure energy hungry businesses, with a promise of power prices, a mere fraction of those paid here. Commercial users in Pennsylvania are paying 8.85 cents per KWh, equating to US$88.50 per MWh. Industrial users are paying 6.67 cents per KWh, equating to US$66.70. Depending on the State they’re in, Australian commercial users are paying upwards of A$0.35 per KWh, or A$350 per MWh hour, in SA it’s A$0.47 per KWh, or A$470 per MWh. According to the US Energy Information Administration, in 2016, Pennsylvania ranked second in the nation in electricity generation from nuclear power, which supplied 39% of the state’s net electricity generation, more than from any other source. In France the average retail power price is $246.30 per MWh (24.63 cents per KWh) which compares rather favourably with the average retail power price in South Australia $471.30 per MWh (47.13 cents per KWh) – a snicker under double the price paid by French power consumers (see below). 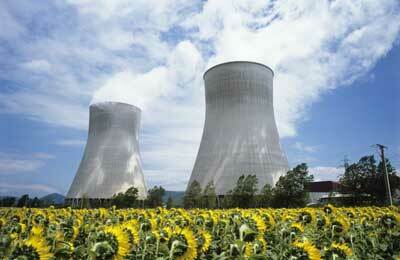 The French have 58 nuclear reactors, which provide them with roughly 75% of their power. South Australia is one of the world’s largest uranium miners, with two of Australia’s three operating uranium mines: Olympic Dam and Beverley North/Four Mile, exporting their output to the French, among others. SA also holds uranium reserves that will last the world for a millennia or more. 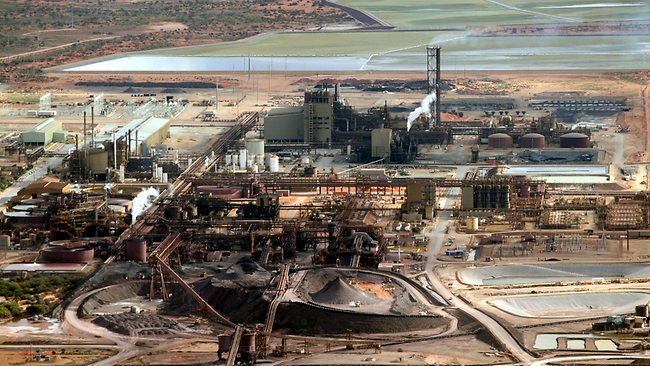 Olympic Dam’s bounty: perfect for the French, but not for us. Does Australia’s ban include fusion power as well as fission power? With ITER showing such promise, commercial fusion reactors, with their long-expected ‘too cheap to meter’ power, could well be a reality within 25yr. Fission reactors, such as the UK’s Hinkley Point C, are so expensive they require at least 50yr of operation to repay their capital cost. So they could be rendered prematurely obsolete, and require much of their costs to be written off, with the losses likely being borne by the taxpayers or the billpayers, one way or another. 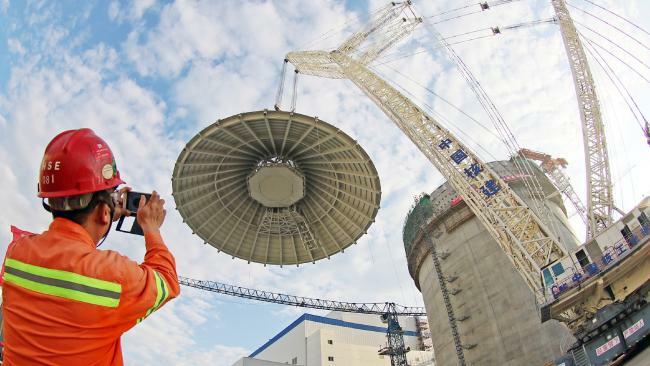 Rather than undertaking a program of new fission reactors, would it not be better to simply do some quick and dirty refurbs of the existing fossil fuel fleet to tide Australia over until fusion arrives? The legislative ban is on any form of nuclear power generation. Which rules out fusion, too. The new Energy Minister, Angus Taylor is working on a program to ensure that Australia does not lose any more baseload generation capacity. The plan includes underwriting the refurbishment of existing coal-fired plant (it won’t be quick or dirty) and the construction of new HELE plant. Australia needs a summer of widespread blackouts before the discussion get serious about overturning the ban on nuclear power generation. And we probably need a group of ageing dinosaurs to die out, being those who rant about Chernobyl or Fukushima every time the word nuclear is mentioned. Fusion is forever on the horizon while safe SMRs are imminent and can directly supplant coal stations and can load follow whatever pointless renewable are already installed. 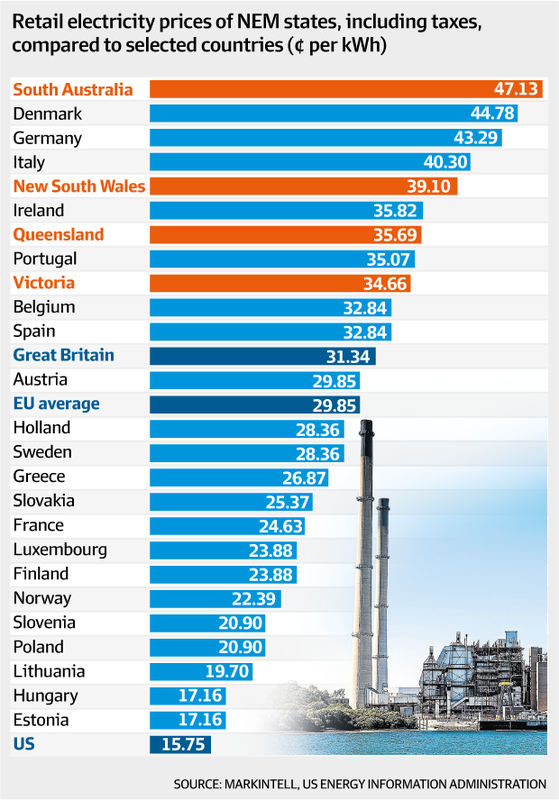 Australia CAN’T afford Nuclear power. End of STT’s propaganda.Nuclear power makes as much sense as renewables both would bankrupt Australia in the end. STT should give us an engineering breakdown of where the Nuclear power stations would be placed and the transmission lines needed and a total costing of the entire project compared to just building replacement coal fired power stations built next or near too the present coal fired power stations as has always been the policy when the states ran the Electricity generation system..
Rubbish, you haven’t read the post. Look up France in the table, refer to the figures for Pennsylvania. The power prices they enjoy, thanks to nuclear power, are a mere fraction of what Australians are paying. The numbers are facts, not propaganda. Australia will have nuclear power when the dinosuars against it die out, people like you and Helen Caldicott, that is. South Korea gets the majority of its power from nukes and has industry and manufacturing, where we are killing both. Engineers in NSW already have the blueprint drawn up for 3 plants, in specified locations. Until governments drop all anti carbon dioxide policies, no new coal plants will be built, and the existing ones will be driven out of business. Nuclear ticks all boxes because the anti CO2 crowd can’t complain on that ground. All they’re left with are specious claims, like yours, about cost and safety. …and SMR’s will improve matters further. The cost of reliable, 100% renewables would be astronomical given the storage required with current technology, and hoping for some future breakthrough would be inane. When will the Coalition bite the bullet and start spruiking nuclear? If it’s not after the next election, win it or lose it, one must presume Big Coal owns them. It’s understandable for it not to want to open a new vista for being attacked before the next election, given the current state of play. Is it possible to take this position when Stop These Things’ attitude up until now has been that CO2 gas is NOT the existential threat that it is made out to be? This is not the first time STT has advovated for nuclear power and won’t be the last. Nuclear works, wind and solar never will. There is nothing inconsistent in our position. Scaremongering over carbon dioxide gas isn’t going away until the next ice age bites. Nuclear is a foil to that. The fact that CO2 alarmists are not pushing nuclear speaks volumes about their real motives. In any event, Australia exports a resource that generates 11% of the world’s power, and we ban its use. What’s reasonable about that?